Postprocessing of geodetic GPS/GLONASS-receivers measurements. Field of application: The packet can be used both for processing of JSC “RIRT” geodetic equipment measurements, and other geodetic receivers. Postprocessing of geodetic GPS/GLONASS-receivers measurements. The packet can be used both for processing of JSC “RIRT” geodetic equipment measurements, and other geodetic receivers. Processing of various receivers single- and double-frequency measurements in “static”, “rapid static”, “reoccupation”, “stop and go”, “kinematic” and “kinematic flight”. High-precision definitions of baselines up to 1-2 thousands km long. High-precision absolute coordinate definitions in PPP mode, including dynamic ones. Measurements conversion from RINEX format (including Compact RINEX) and backwards. Automatic creation and maintenance of project archives. Session scheduling using user-extendible points list. Screen and printer output of final reports. Delivered in single- and double-frequency options. 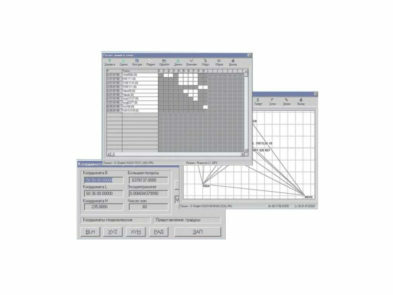 BL-L/G FOR WINDOWS GSSoftware packet is designed for postprocessing of geodetic receivers measurements. The whole of completely automatic processing of both separate lines and any combinations with broad opportunities of participating in the experienced operator processing. The use of state-of-the-art algorithms for baselines accelerated processing and fast phase ambiguity resolution. GLONASS measurements processing, in particular off-line processing. High-capacity set of instruments for tasks solving under adverse observing conditions. Unprecedented broad opportunities for measurements editing and masking. The opportunity of using meteorological data in order to raise the solution precision. The opportunity of using SP3 precise ephemeris. The processing results output both in graphic and table form. The opportunity of calculating the local coordinates and the points altitudes.